Definition at line 56 of file splay.h. Definition at line 63 of file splay.h. Definition at line 62 of file splay.h. Definition at line 60 of file splay.h. Definition at line 61 of file splay.h. Definition at line 59 of file splay.h. Definition at line 64 of file splay.h. Definition at line 366 of file splay.h. Definition at line 347 of file splay.h. Referenced by mem_hdr::freeContent(), main(), testSplayOfNodes(), ACLDomainData::~ACLDomainData(), and ACLHTTPStatus::~ACLHTTPStatus(). Definition at line 80 of file splay.h. Referenced by ACLDomainData::empty(), and ACLHTTPStatus::empty(). Definition at line 373 of file splay.h. Definition at line 285 of file splay.h. Referenced by MemPoolChunked::convertFreeCacheToChunkFreeCache(), mem_hdr::getBlockContainingLocation(), ACLServerNameData::match(), ACLDomainData::match(), mem_hdr::nodeToRecieve(), testSplayOfNodes(), and mem_hdr::unionNotEmpty(). Definition at line 337 of file splay.h. Referenced by mem_hdr::dump(), mem_hdr::endOffset(), mem_hdr::freeDataUpto(), mem_hdr::internalAppend(), main(), mem_hdr::makeAppendSpace(), and testSplayOfNodes(). Definition at line 300 of file splay.h. 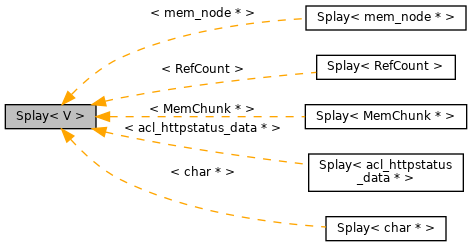 Referenced by mem_hdr::appendNode(), main(), MemChunk::MemChunk(), ACLDomainData::parse(), and testSplayOfNodes(). Definition at line 314 of file splay.h. Definition at line 359 of file splay.h. Referenced by mem_hdr::copy(), main(), mem_hdr::makeAppendSpace(), mem_hdr::nodeToRecieve(), and mem_hdr::size(). Definition at line 327 of file splay.h. Referenced by mem_hdr::dump(), mem_hdr::freeDataUpto(), mem_hdr::lowestOffset(), main(), mem_hdr::nodeToRecieve(), mem_hdr::start(), and testSplayOfNodes(). Definition at line 276 of file splay.h. Referenced by mem_hdr::debugDump(), ACLDomainData::dump(), and ACLHTTPStatus::dump(). Definition at line 91 of file splay.h. Definition at line 90 of file splay.h.